Review by Che the RED on 5/29/2015. Review by nemanja.88 on 5/28/2015. Great map. 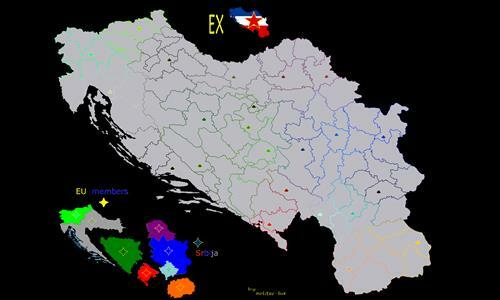 I recommend this map to all ex-Yugoslavs. I appreciate your making a map with more than a handful of territories - there are so many more possibilities for a good game here. This map plays very quickly and is quite fun. The multiple tiers of bonuses, as well as the basic 1:1 bonus ratio, provide extremely high income very quickly. You've got to be nimble and cunning to win here. Review by RvW on 6/6/2015. (and quite a few more). Bonuses on this map are far more generous than most other maps, so don't be surprised if your income skyrockets (but be careful, so does your opponent's income!). Tip: The Crna Gora ("Montenegro") and Makedonija bonuses make great starting places! Review by LImeCharlie on 5/31/2015. Review by bogo on 1/2/2016. With Macedonia (FYRM) is too easy too win. Review by FlamingPwner on 2/13/2016.